Full-term babies normally come out of the womb ready to breathe on their own, but the way your baby breathes might alarm you at times. Newborns normally breathe faster than older children and adults do. They might also have more irregular breathing patterns. If you're concerned about your baby's breathing rate, talk with your doctor. Seek immediate medical help if your baby struggles to breathe or seems to be in distress, regardless of how often he's breathing. A normal newborn breathes between 30 to 60 times per minute. Although this is much faster than the normal adult breathing rate of 10 to 20 times per minute, it's normal for newborns. When your baby cries or is active, his breathing rate will generally be higher than when he is sleeping or quiet, but still less than 60 breaths per minute. 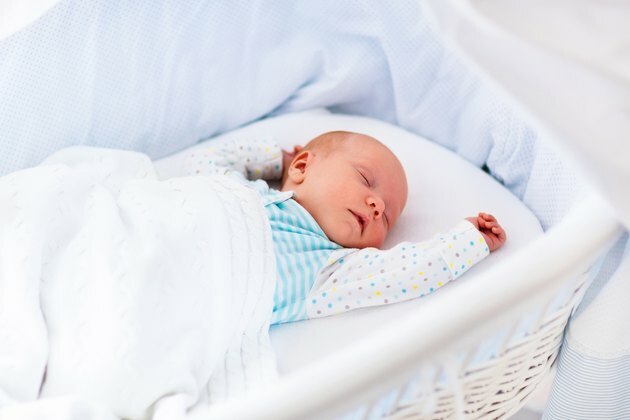 You may notice your newborn breathing faster when he is in the sleep stage of rapid eye movement, when you can see his eyes moving under the lids. This is normal as long as his breathing rate remains within the normal range. Seek immediate medical care if your baby turns pale or blue, has periods when he stops breathing for 15 seconds or longer, makes grunting, gurgling or wheezing sounds while breathing, has flaring of his nostrils or otherwise appears to be struggling to breathe. These symptoms can indicate a problem with his lungs or another organ -- even if his breathing rate is normal. Care of the Newborn: A Handbook for Primary Care; David E. Hertz, M.D. What Are the Causes of Rapid Breathing in an Infant? What Is a Normal Respiration Rate? How Many Calories Does it Take to Breathe?